The LTTE once again displayed its true face of terrorism in Colombo deploying yet another Tamil civilian on a suicide mission to appease the Tiger leader Velupillai Prabhakaran’s thirst for human blood. 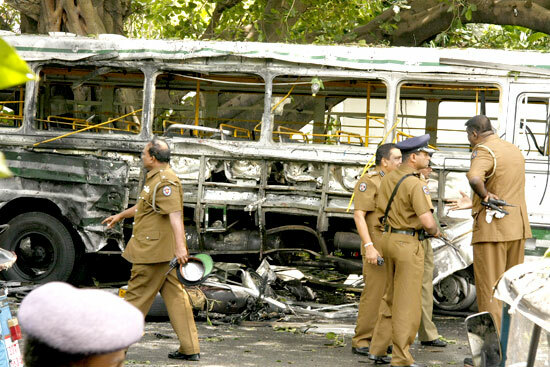 Seven Police officers including three Women Constables and three civilians were killed and 85 others were injured in this brutal bomb blast in the heart of Colombo on Friday noon. Colombo Crime Division sleuths have taken in for questioning a man on suspicion in connection with the bomb explosion opposite the Sambodhi Viharaya at Lotus Road in Fort that killed 10 persons and injured 95 persons, Police media spokesman, told the Sunday Observer.